Motor vehicle collisions are the leading cause of accidental death and injury worldwide. The injuries caused by road accidents vary depending on the mechanism of injury involved in the collision. To identify the possible injury pattern to the occupant start by looking at the vehicle and determine which of the five types of collisions occurred. The occupant will have received the same kind and amount of force as the vehicle. 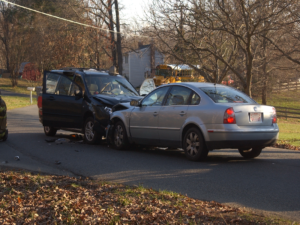 Frontal impact, or head-on, involves the vehicle colliding with another vehicle or object, such as a wall. The first collision occurs when the vehicle hits the wall, although the vehicle suddenly stops, the occupant continues to move forward. Modern vehicles with seat belts and airbags can reduce the possibility of serious injuries, but some people still do not wear seat belts. An unrestrained occupant will move in one of two directions, either down and-under or up-and-over. During the down-and-under pathway, the occupant continues to move downward into the seat towards the dashboard and steering column. The majority of the injuries will be to the lower extremities, caused by the knee striking the dashboard, examples include dislocated knees and hips and fractures to the femur and tibia. Rear impact collisions occur when a slower moving or stationary object is hit from behind by a faster moving one. On impact the vehicle in front is accelerated forward, as is everything in contact with the vehicle. If the occupant’s headrest is incorrectly positioned the torso will move forward and the head will move backwards, over the top of the headrest, resulting in hyperextension of the neck, possibly tearing the neck’s ligaments and fracturing the vertebrae. If the vehicle then stops suddenly, for example, the driver brakes or the vehicle strikes another vehicle, the occupants will move forward following the format of a frontal impact collision, resulting in two impacts − rear and frontal. The likelihood of injury is increased considerably with the double impact. 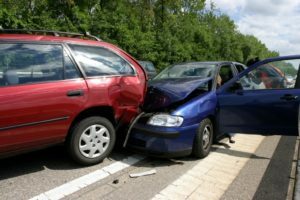 When dealing with a rear impact collision first aiders should look for two sets of injuries, those caused by the first rear impact and those caused by the secondary frontal impact. Lateral impacts occur when a vehicle is struck from the side, for example a vehicle failing to stop at a give way and striking a vehicle on the major road. The vehicle is pushed sideways by the collision and the side of the vehicle or door may be pushed against the side of the occupant. It is possible for the patient to be injured in three separate ways: striking the inside of the vehicle; colliding with other unrestrained passengers; and intrusion of the side panels or the door into the passenger space. 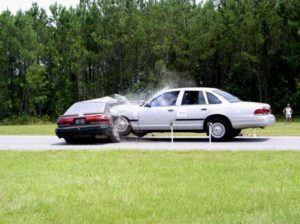 Injuries caused by the vehicles movement are not as serious if the passengers are restrained and move with the vehicle. Neck: The torso moves sideways from under the head resulting in sideways flexion and rotation which can fracture or dislocate the cervical vertebrae. Head: The head can collide with the frame of the door or unrestrained passengers. Chest: The side of the vehicle colliding with the occupant can results in compression of the thoracic wall resulting in fractured ribs, pulmonary contusion and injuries to the aorta.The clavicle can also be compressed and fractured. Pelvis: The intrusion can compress and fracture the pelvis and dislocate the femur. Occupants on the driver’s side are vulnerable to liver injuries because the liver is on the right side of the body, whereas those on the passenger side are more likely to receive an injury to the spleen. Rotational impact collisions occur when one corner of the vehicle strikes another vehicle or object, for example a car clipping a bus.The corner of the vehicle striking the object will come to a standstill while the rest of the vehicle will spin. During a rollover collision, a vehicle may undergo several impacts at many different angles, as may the occupant’s body and internal organs. As injury and damage can occur with every single impact it is not possible to predict the injuries that these victims receive.